A Picture is Worth a Thousand Words - SacGovHomes - HUD Homes in Sacramento CA, El Dorado CA and Placer CA. Quality photos have always been a staple of real estate. They are often the first glimpse a buyer has of the property, and we all know how important first impressions are! Most times, it’s not just the house that a real estate agent must sell, but also what’s around the house. I like to tell our photographers, “Capture what catches YOUR eye, be creative.” Well this property, 4030 Boulder Point Drive in Placerville, CA just happened to be situated on a sizable lot in the Sierra Nevada Foothills and was surrounded by gorgeous oak trees. 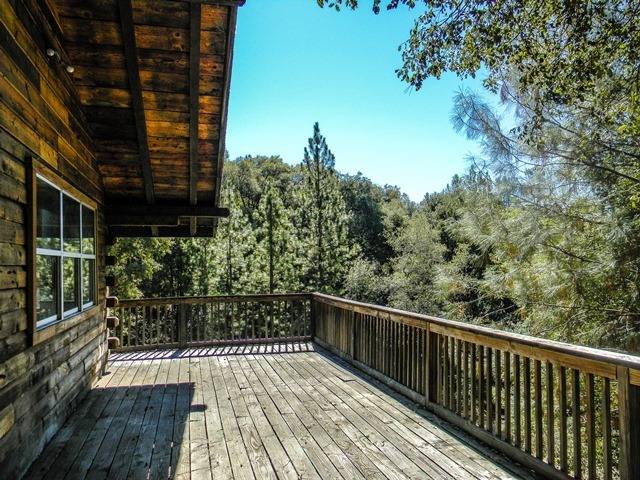 The property has two homes on it, one being a very neat rustic cabin with a deck overlooking an opening in the trees. Recently, we received a heartfelt email from a previous renter of this particular listing, just sharing with us how much he and his family enjoyed the photos we had taken. The gentleman had found the home for sale on Zillow, and immediately recognized the scene that was captured. “To share a little of our story, we ended up at this cabin after moving around Placerville/Somerset for the better part of our childhood. The cabin was fairly small for a family of four, but it seemed to bring us together, and the weather and area surrounding the cabin meant we didn’t spend that much time indoors anyhow. My sister and I truly cherished the times here, playing on the huge granite boulders nearby and in the woods surrounding the house. We’d take trips to the Consumnes river as a family or with the neighbors and have a picnic by the river. The remoteness of the cabin and the beauty of the area around it made it a really unique experience for all of us in our own way. He went on to tell us that he and his sister had the picture framed, which they ended up giving their parents for Christmas. Truly a story such as this one made our day, and it really goes to show that taking the time to compose a thoughtful real estate photo can end up affecting more than an agents bottom-line. It can change somebody’s life.